ONB Bank will be participating once again in a food and fund drive for Channel One. 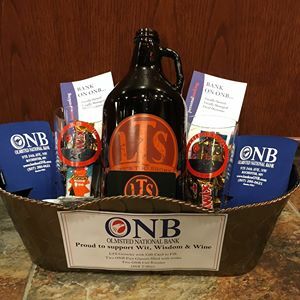 You can drop off your donations at any ONB Bank location. The drive will be held from March 18th-April 1st 2019. As always, non-perishable food items only. Approximately 15% of the food that is distributed in Channel One’s Supplemental Food Shelf comes from community food drives. Every $1 donated, allows Channel One Regional Food Bank to provide enough food for 4 meals. ONB Bank offices will open at 8:30am, Monday, February 25, 2019. This will allow our staff to safely commute to work during this winter storm. We thank you for your patience and understanding. We are excited to announce that we were able to raise $1,770 in 2017 with our Employee Jeans Day donations! Our staff has the option of wearing jeans on Fridays for $10/month. At the end of the year everyone nominates their favorite charities and a few are drawn to receive the proceeds. Through our staff’s dedication to give back to our community, we were able to donate to 4 different charities this year. Stop into ONB to open your new savings account today! ONB is a proud sponsor of the YMCA LIVESTRONG Family Fun Run and Walk taking place on Saturday October 14, 2017. This event brings the community together to celebrate those who are living beyond cancer diagnosis and to remember those lost to cancer. ONB Bank is providing this announcement as a courtesy for its customers and is in no way directly connected to this incident. The information accessed primarily includes names, Social Security numbers, birth dates, addresses and, in some instances, driver’s license numbers. In addition, credit card numbers for approximately 209,000 U.S. consumers, and certain dispute documents with personal identifying information for approximately 182,000 U.S. consumers, were accessed. As part of its investigation of this application vulnerability, Equifax also identified unauthorized access to limited personal information for certain UK and Canadian residents. Equifax will work with UK and Canadian regulators to determine appropriate next steps. The company has found no evidence that personal information of consumers in any other country has been impacted. ONB Bank is a proud supporter of PossAbilities. PossAbilities will be hosting an event on Friday April 28th, 2017, Canadian Honker Events at Apache, Rochester. The fun starts at 5:30pm. Awesome appetizers, craft beer tasting, can’t miss cuisine, wine sampling, wall of craft beer & wine, experts describing craft beer, silent & live auction. Take this opportunity to support PossAbilities and all the individuals that they serve. If you will be attending the event, check out our silent auction basket! For more information about the event, visit https://www.possabilities.org/story/events/. Be vigilant in reviewing your financial statements and monitoring your transactions. Develop the good habit of monitoring your financial accounts (e.g. bank, credit card, retirement etc.) at least weekly through online, mobile, voice banking or the ATM. Never leave your computer, tablet or mobile phone unattended when using any Internet banking, mobile banking or other financial services. After you have completed your Internet or mobile banking session, it is good practice to log off to ensure that the session is completed. It is also good practice to lock your computer or mobile device whenever you plan to leave it unattended. Never use publicly available information to create your password. Examples to avoid are common names or phrases, birthdates, social security numbers, etc. And of course, it goes without saying that you should never reveal your password to anyone. Change your passwords frequently. Establish a routine where you change your password every few weeks to reduce the risk of a compromised account. Avoid using password managers. Even though they may be convenient, password managers create a habit of not changing your passwords regularly and therefore make it easy to forget your passwords over time. Never click on links or applications that you receive in e-mail, as those are common ways viruses, malware and malicious software are installed. If you get an e-mail with links purporting to be from your financial institution, please visit your financial institution’s main website through your browser or call your financial institution to verify legitimacy. Keep your passwords/pin confidential. Under no circumstance will you be asked to provide it to your financial institution. While using the Internet, verify use of a secure session (“https://” and not “http://”) in your browser’s address bar. This is your indication that the data being transmitted between your browser and your financial institution’s systems is securely encrypted. Install anti-virus and anti-malware software. There are many good applications available for both your computer and your mobile device. Some are even free. Also, remember to keep these products updated regularly so they can be most effective. If you have a mobile device such as a Smart phone or tablet, ensure that you install software capable of remotely wiping the device should it get stolen or lost. The minute you suspect that your device is lost or stolen, notify your mobile carrier and suspend your service. Install mobile software only from the Android Market or the Apple App Store and never a 3rd party site. Android users should read the permissions requested by the application carefully and determine whether the permissions coincide with the alleged function of the application. Do not “jailbreak” your iPhone or “root” your Android to avoid unintentionally opening “backdoors” for malicious software. Turn off wireless device services such as Wi-Fi, Bluetooth and GPS when they are not being used. Avoid using unsecured public wireless connections. If you must, then use VPN software to provide a secure “tunnel” within which to work. Be aware of the types of information that you post to social networking sites. Ensure you know who your “friends” are on such sites and do not accept “friend” requests from unverified parties. Statistics show that users of such sites experience a higher incidence of fraud. Use privacy settings on social networking sites to control who is able to access your personal information. If your Internet and mobile banking service has extensive alerts available for your use, be sure to take advantage of these alerts. Once you set up the alerts you need, your financial institution’s systems will notify you of activity on your accounts. Checks and your financial statements all have your private financial information on them. Request electronic statements and use online bill pay whenever possible to reduce the paper trail and the risk of your account information being compromised. If you suspect fraudulent activity or have doubts about the authenticity of a site or communication you have received via any medium, please call your financial institution at 507-280-0621 or 507-280-0028. Protecting your identity and personal information consists of constant monitoring and an understanding of how the electronics you use on a daily basis operate. This article talks specifically about Mobile Apps. What is a mobile app? What types of data can apps access? Could an app infect my phone with malware? To learn more please visit https://www.consumer.ftc.gov/articles/0018-understanding-mobile-apps. ONB is a proud supporter of Next Chapter Ministries. Next Chapter Ministries is hosting their Annual Restoration Celebration on March 17, 2017 at the Rochester International Event Center. For more information on what Next Chapter Ministries does and how to get your tickets to this event, please visit http://nextchapterrochester.org/. Stop in to speak with a Personal Banker today for more information on ONB Savings Accounts. ONB is a proud sponsor of the Rochester Area Sports Banquet, hosted by Rochester Amateur Sports Commission. The banquet takes place on January 30, 2017 at the Mayo Civic Center – Exhibit Hall. Silent auction proceeds will benefit Bolder Options. ONB Bank will be closed on Monday January 16th in observance of Martin Luther King Jr. Day. We will resume regular hours on Tuesday January 17th. We are excited to announce that we were able to raise $1,510 in 2016 with our Employee Jeans Day donations! Our staff has the option of wearing jeans on Fridays for $10/month. At the end of the year everyone nominates their favorite charities and a few are drawn to receive the proceeds. Through our staff’s dedication to give back to our community, we were able to donate to 3 different charities this year. ONB Bank will be closed on Monday January 2nd in observance of New Year’s Day. We will resume regular hours on Tuesday January 3rd. We wish you a Safe and Happy New Year! There have been a few recent changes to our website. We now have a Business Banking Online feature. With the Business Banking Online feature you can setup administrator control over who can access your account. You control what your bookkeepers, employees, CPA, etc. can access. You can also create your own ACH batches for payroll, making payments, accepting payments from customers and more. Wire Transfers can also be requested securely. Please call to set up a time to come in and get your business switched over to the new Business Banking Online. If you are a business currently using online banking and haven’t made the switch yet, you will need to log into your accounts using the Personal Banking Link. ONB Bank proudly supports Rochester Community Housing Partnership. Rochester Community Housing Partnership (CHP,) a non-profit, has a mission of educating, collaborating and advocating to provide affordable housing in southeast Minnesota. The pre-purchase counseling offers new homeowners the ability to review their current financial situation and find a mortgage product that will best meet their needs in obtaining a home. Home Buyer education gives a new homeowner a better understanding of the process of buying a home. The goal of home buyer education is to prepare the buyer for Obtainable, Maintainable, and Sustainable homeownership. Homeowners counseling-foreclosure counseling walks people through the opportunities of staying in their home when their financial picture is or has changed. To learn more about Rochester Community Housing Partnership, check our their website rochp.org. Once you are ready to take the next step, stop into our ONB Main Office to see Josh Buckmeier for all your Real Estate Lending needs. The IRS has announced that the longstanding interpretation of the one-rollover-per-year rule will be changing effective January 1, 2015. Historically, the understanding has been that this rule applies to each IRA an individual owns. However, beginning “as early as January 1, 2015”, according to the IRS website announcement, “you can make only one rollover from an IRA to another (or the same) IRA in any 12 month period, regardless of the number of IRAs you own”. For more details, see the IRS announcement on their website: http://www.irs.gov/Retirement-Plans/IRA-One-Rollover-Per-Year-Rule. Important Notice: Unauthorized access to payment card data at Supervalu Grocery Stores (Cub Foods). A data breach at Supervalu may have impacted as many as 200 of its grocery and liquor stores and potentially affected retail chains recently sold by the company in two dozen states, including Cub Foods. The breach occurred between June 22nd and July 17th. The information theft included customer name, credit or debit card number, the card’s expiration date and CVV (the three-digit security code). MasterCard provided ONB Bank with a list of debit cards that may be at risk and if your name appears on any list you will receive a personal phone call from the bank to discuss your options. As always, please review your statements for unusual transactions. If you suspect fraud, please contact ONB Bank immediately at (507)-280-0621. On July 29, 2014, Google announced that Android® devices could be left open to attack from malicious apps that appear to come from legitimate developers, due to a flaw in Google’s mobile software. The flaw has been named “Fake ID” by security company Bluebox Labs, which discovered it. Fake ID has been resident in Android® from version 2.1 to 4.4. Apparently, Google issued a fix in April as part of the latest update, Android® 4.4, also known as KitKat 4.4. If you have not upgraded your device to this version of their operating system, your mobile device could still be at risk. You can easily verify your software version by going to Settings>About Phone and looking for the Android software version installed. We make no recommendation of any third party security products. However, you may wish to review and determine if such services are appropriate for your individual needs. We recommend that you upgrade all of your Android® device operating systems to version 4.4 or higher. We also recommend that all of our mobile banking clients update their operating systems as soon as possible after being prompted by the device to ensure a safe and secure mobile banking experience. We have added a new feature to ONB Mobile App, Mobile Billpay!! Whether you’re at home, work, or on the go, use the ONB Mobile App on your smart phone or tablet to pay bills when it’s convenient for you. Bounce back and forth between the Online Banking and Mobile App versions seamlessly. They’re synced for accuracy and convenience. That’s important! For current ONB Mobile App users, just download the update from the App Store on your mobile device and start using this convenient service!